Upland Life spent a little time at the Mason-Dixon GSP Club's annual spring hunt test, held at the McKee-Beshers wildlife management area along the Potomac River near Poolesville, MD. 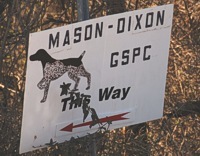 The Mason-Dixon club's road sign shows the way to the event grounds at Maryland's McKee-Beshers preserve. Two handlers talk with a judge while they prepare to send their dogs out for a leg of their Junior Hunter titles. Handlers get some course guidance from the judges that will observe their brace of dogs. Handlers have one last chance to remind their dogs who's in charge. A GSP and a Vizsla break away from the line for their junior test. A double point during a junior hunt test. A handler kicks for the bird her junior Vizsla is pointing. A handler signals the junior hunt test judges that her dog is on a point. Gunners and bird planters chat while waiting on the sidelines for a brace of master dogs to enter the bird field. A German Shorthaired Pointer launches into the bird field during a master hunt test. A GSP moves through the sorghum with a purpose. A GSP shows a fine 30-yard back during a master hunt test. Display a higher-resolution version of this image to see what the backing dog is seeing. It's not what it looks like! The handler (who stays very much on her feet), holding a prop gun, has just kicked the Chukar up for the gunner. The other handler is staying low and out of the way. A pointer gently retrieves a wounded chukar. A pointer, with a happy spring in her step, speeds her retrieve. Thunder the GSP locks up stylishly while pointing a chukar in the edge of a sorghum strip. A Weimaraner quarters the bird field during a master hunt test. The blaze orange cape keeps him highly visible to handler, judges, and gunners. A master Vizsla retrieves a chukar to hand. A Vizsla puts the 'waaay back' in backing. A Vizsla quarters out in front of his handler. Master shorthair bracemates are independently working the bird field. An Irish setter frisks on the hunt test grounds before her junior test. The McKee-Beshers pavilion is the hub of the M-D GSP hunt test activity. A hunt test judge has words with his single-minded mount. By day's end, that mule will have walked the course many times. Ah, steadiness. A Vizsla's senior handler is able to take his time walking up to the flush because he's been able to trust that dog to hold her point for over 10 minutes. A Brittany quarters the bird field after a long run through the master test back course. A Brittany clears a line of knocked-down sorghum as he quarters through a master hunt test bird field. A Pointer runs through a sorgum patch. Pointer and mom watch the bird field from the sidelines. A handler softly cautions his shorthair, who has hit on a point while passing a bird to his side. A GSP shows his field-trialing family heritage and covers the master field at a brisk pace. A shortair uses his powerful build to easily clear a dense tangle of briars as he works a hedgerow. A GSP makes for his objective - the cover provided by a stripe of beat-down sorghum - at full throttle. His whiter coat helps him stay cool (and more visible) in strong sun. A handler and his steady shorthaired companion watch as a gunner takes down a just-flushed chukar. 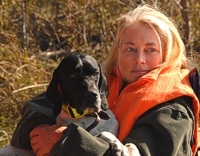 A shorthair retrieves a just-shot chukar. He moves right past the gunner, and brings the bird to his handler's hand. A nice back, one shorthair coming across another already on point. A liver shorthair stretches out on the run. A brace of shorthairs dash through a tree line between fields. More! Did you like this coverage?